Actually, it's not recorded live for anyone's pleasure. Rather, this is to instruct and inform. "What are you nattering on about, Cowboy Bob?" Some people want me to do podcasts. I'm not sure about that yet. I was on a radio show/podcast recently. We discussed atheism, logic, how atheism is fundamentally flawed in the logic department, stalkers, Christians, presenting the gospel message, worldviews, evolutionary presuppositions and more. Here is a link so you can listen and find out more. It's probably time for me to point out again that I know jolly well that there are different kinds of atheists in the world. Some are the "live and let live" types: "You believe, I don't, we can talk about it, or not". I do not check to see if the cashier at Wal-Mart, the mail carrier, the server at the restaurant, the lady in the apartment across the hall or other people are atheists. Unless we're having a conversation about spiritual things. 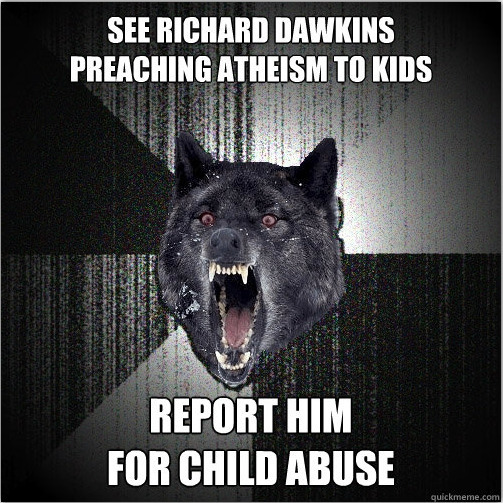 Then there's the aggressive angry atheist. These are the vicious ones that haunt the Internet and seek out Christians to attack. I doubt that they have jobs or lives; who would hire them or want to be around them? OK, so I've differentiated. It's the hateful atheists that I encounter the most. 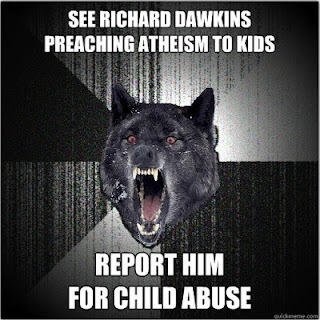 They tend to be disciples of Richard "Daffy" Dawkins and other purveyors of bigotry disguised as "reason". His sheeple heard Dawkins tell them to mock "religious" people. His twisted view of the vague evil phantom of "religion" includes calling the teaching of religion to children "child abuse". The last I knew, people have the right and responsibility to instil their values in their children! Dawkins even has a propaganda book for kids. 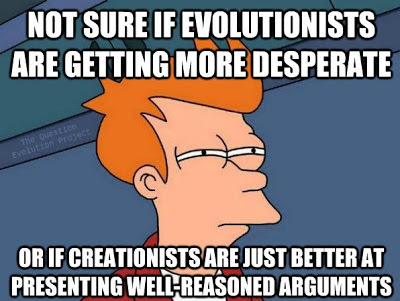 Can you imagine if he clearly spelled out evolutionary atheism? In the beginning was nothing, which exploded. Stars, galaxies, planets formed. Eventually, through an unknown mechanism, the impossible happened: Life began by pure chance. It gradually became more complex over huge amounts of time. Eventually, you evolved. You are just a modified blob of protoplasm without purpose, without meaning and when you die, there is no final judgment or loving arms of the Savior. You're just worm food. 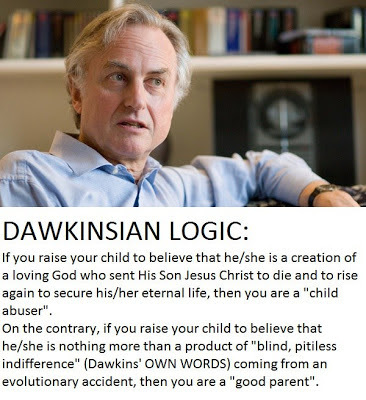 The atheist "message of hope", in its honest form, is true child abuse. But it's getting more fun! Naturally, some people want creationism banned here, and religious education, and so forth. So often, things that happen in European socialist countries are a testing ground or a forerunner for what happens in America. What is coming next? Those of us who are not statists, and who believe in traditional Judeo-Christian values are going to fight it, whatever evil comes our way (that's one reason Socialist-In-Chief, B. Hussein Obama is losing his job in November). 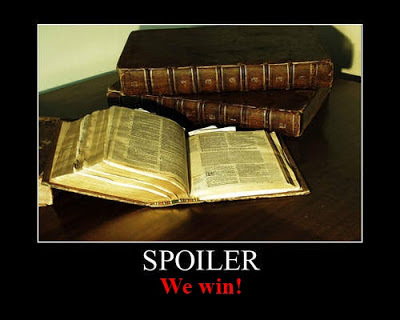 The good news for Christians is that the ultimate victory is ours! Wish I had thought of this! Found the picture in a group on Facebook, posted it at "The Question Evolution Project". One clever lad commented, "Nyerony". Ha! 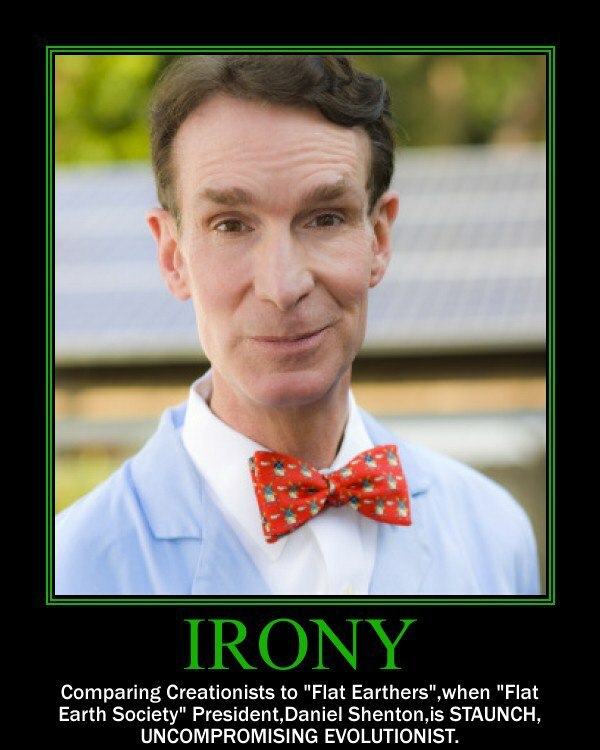 There are still some challenges for Bill "I'm not a scientist, I just play one on TV" Nye. Are you going to stand up to Georgia Purdom and take the debate challenge? 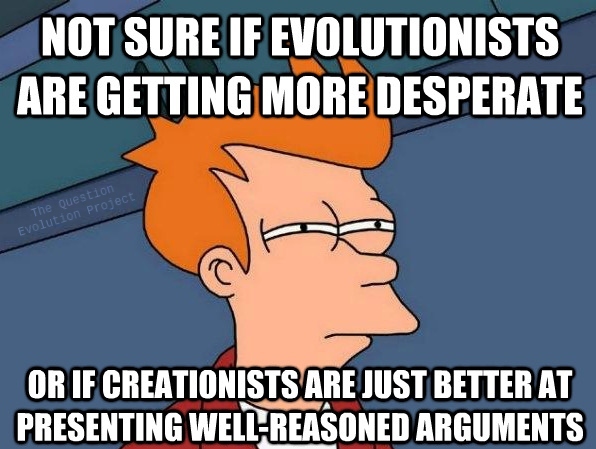 Second, can you give one invention, one piece of technology, that required its inventor to believe in evolution?